An extensive collection of PowerPoint slides, covering a diverse array of topics, is available for use by growers and researchers for general outreach use. The topics include descriptions of genetic engineering of plants and insects and how these might be used to address HLB, nonengineering approaches, regulatory issues, consumer attitudes, labeling efforts and trade issues. The PowerPoint file is available as one file, as well as broken out into sections, listed below. These files will be updated regularly. 1. What are the general processes of genetically modifying plants and insects? 2. What genetically engineered plants and insects are in the commercial market? 3. What genetically engineered plants and insects are in the pipeline? 4. What is the regulatory process for approving new genetically engineered plants? 5. What is the regulatory process for approving new genetically engineered insects? 6. How might the regulatory landscape for genetically engineered plants and insects be changing? What is the possible impact? 7. What are consumer attitudes toward engineered crops and foods? 8. Are consumer attitudes different depending on whether plants or insects are engineered? 9. 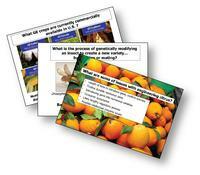 What are citrus grower attitudes about genetic engineering and what type would they prefer? 10. What is the current status of labeling foods made from engineered plants? 11. Might labeling change attitudes and acceptance? 12. What trade issues might arise with foods made from engineered plants? Have comments or questions? We would love to hear from you! Please let us know via email.